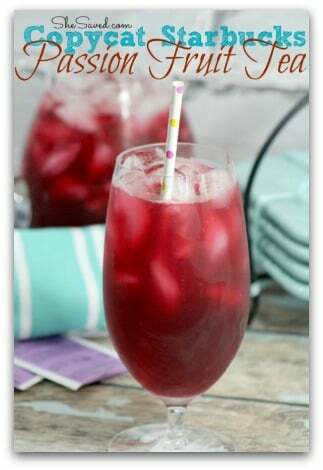 The weather is getting hotter and that means that the drinks need to get cooler! We love this CopyCat Chick Fil A Frosted Lemonade recipe because it is a sure fix to help cool you off from the summer heat and it’s super affordable, so it won’t break the bank! 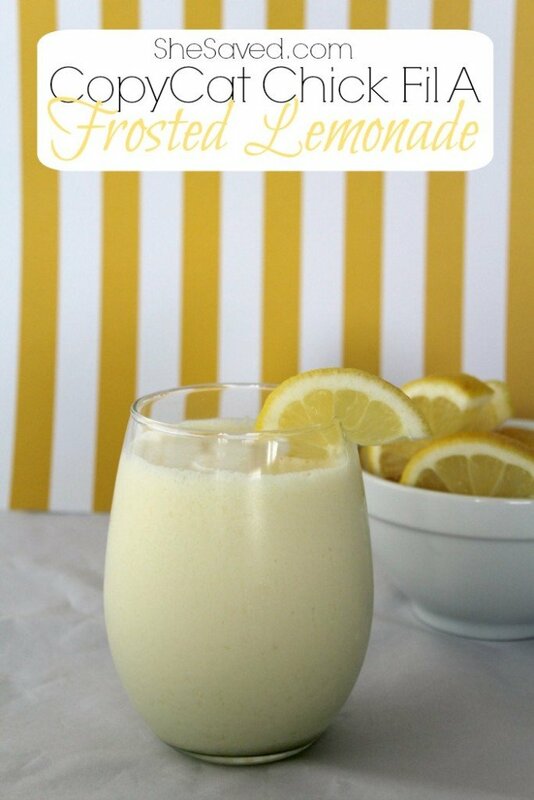 Fire up the blender and in just minutes you will have this refreshing frosted lemonade to share! Oh and did I mention? Just TWO ingredients! This recipe is perfect for parties and for a fun touch, you could even add in some cute paper drink umbrellas! Blend lemonade and ice cream together. I use one part lemonade to two parts ice cream. For example: 1 cup lemonade to 2 cups ice cream. 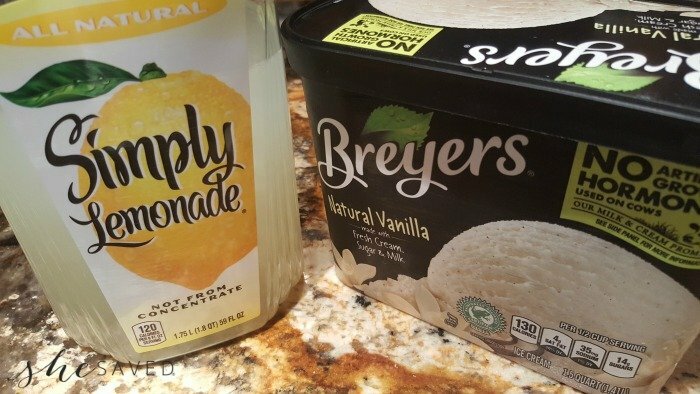 I get a LOT of questions about what we use to make these, and it’s literally just TWO ingredients and we almost always use the two shown above: Simply Lemonade which is NOT from concentrate and Breyers Natural Vanilla Ice Cream. You obviously don’t need too use these two brands, but I can tell you, they are tried and tested and make a pretty close to perfect drink! We have even made this by adding frozen concentrate directly, which makes it even icier, and usually a bit more tart. You can really add more or less lemonade as you see fit. We like ours a bit thicker, but you can obviously thin it out by adding more lemonade. I find that the creamier the ice cream is, the better these blend and taste. (In other words… spend a little bit more for the good stuff, you’ll be glad you did!) If you are looking for an even more refreshing drink, you can also add ice to the blender for more of a slushy frosted lemonade. Serve in chilled glasses and garnish with lemon slices. Looking for something great to pair this drink with? We LOVE it with my Fried Banana Recipe or my Easy Homemade Funnel Cake Recipe. If you are after refreshment on the cheap, then I have you covered! This simple Copycat Starbucks Passion Fruit Tea Recipe will help you to duplicate this amazingly popular Starbucks drink, but your pocket book will thank you for all of the money that you saved! It’s easy to make and soooooo yummy! Get the recipe here. It is so easy to whip up and everyone in my family loves it. 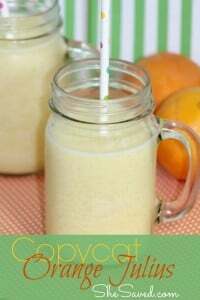 We love it as an afternoon treat, but we actually enjoy this copycat Orange Julius recipe with breakfast quite often as well. It tastes just like the Orange Julius drinks that you get at the mall, but obviously at a fraction of the cost! The more that you make this recipe, the more that you can experiment with it. My family prefers the simple Orange Julius type flavor, but sometimes I will add in strawberries or raspberries just to zing it up a little. get the recipe here. The best thing about summer drink recipes is that you can always improvise with things that you have on hand, use lemons or limes (or even oranges or berries!) for garnishing. I also love to find different serving options for our summer drinks and if we have drinks left over, I almost always pour them into popsicle molds so that the kids can enjoy them later! What lemonade did you use? Funny, I thought if you added more ice cream it would get thicker not thinner. I was hoping you would give a copy cat lemonade receipe. what lemonade did you use? and yes did you use concentrate or mix with water? Pre made lemonade or concentrate? Jen - great catch! I updated ... adding more lemonade will make it thinner, is what I meant to say - thank you for pointing that out! I updated the post to include the lemonade that we usually use - it's pretty tart. I have always made it with concentrate and you are right - 1:1 would be better for that and honestly, that is my son's favorite way to have it because it also makes it even icier. Thanks Jennifer! Hi Bonnie! We use Simply Lemonade which is a NOT from concentrate however you can also use concentrate (makes it icier) and then maybe just adjust to more of a 1:1 ratio as mentioned in the last comment. Thank you - let me know how it goes! We use Simply Lemonade which is a NOT from concentrate but tends to be extra tangy, which we like. We use Simply Lemonade which is a NOT from concentrate, thanks Nichole! The more concentrate, definitely the more flavor. We usually use Simply Lemonade which is a NOT from concentrate, but has a very tart flavor so it stands out nicely. Was curious, do you think it would be good to do 1/2 vanilla and 1/2 strawberry for a twist? Also, do you think you could add vodka to this for an adult treat? Renee - I think 1/2 strawberry ice cream would be amazing! I have never changed the ice cream flavor, but we have made it with raspberry lemonade, which was really good too. I don't think you could go wrong with any of these flavors, they all go so well together! I love their frosted lemonades! This will be perfect to make at home this summer. Yum! Have you tried the Frosted Coffee? I always loved the lemonade till one day I gave the coffee a try - Delicious on hot days for coffee lovers. I may have to try making a copycat of this at home.